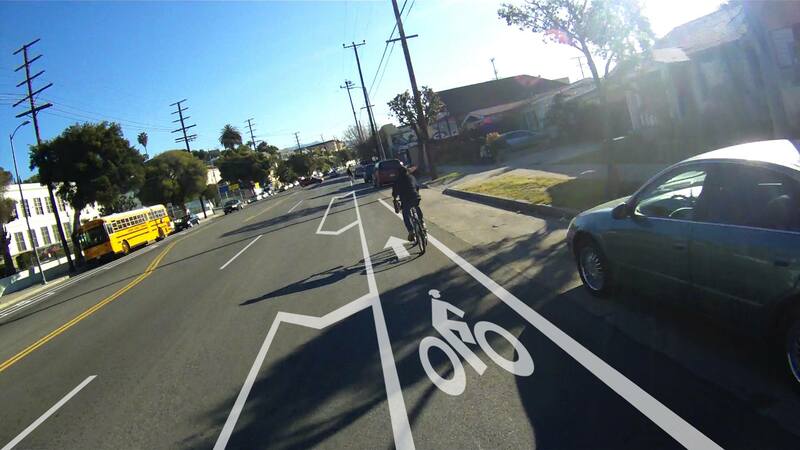 Rendering of the planned buffered bike lane on North Figueroa Street. Yesterdays’ Council vote signals a further step away from a North Figueroa that would be safer for all. Image: Flying Pigeon L.A. Yesterday, the Los Angeles City Council approved the list of projects [PDF] that the city plans to submit for Metro Call for Projects funding. Overall, the Call list includes a lot of great projects that reflect that many L.A. City elected officials and the city’s Transportation Department (LADOT) are truly pursuing greater livability and safety. Unfortunately, the list also includes the “North Figueroa Great Streets Corridor,” City Councilmember Gil Cedillo’s proposal to add diagonal parking to North Figueroa Street instead of bike lanes. The LACBC further clarified concerns in their comment letter [PDF] which urged Council President Herb Wesson to re-scope the North Figueroa project to align with the inclusive vision in the city’s bike and mobility plans. The City Council, which generally defers to the councilmember who represents the district where a project is located, approved the Call for Projects list unanimously. Yesterday’s vote gives LADOT staff the go-ahead to seek funding for Cedillo’s project. The project will compete with other applications for Metro funding. If project funding is approved by Metro in mid-2015, funding would be programmed beginning in FY 2019-2020. The project scope could be modified during design and environmental review processes. The council didn’t listen, but Metro is likely hearing the pushback loud and clear. Anyway, whenever the Metro Board deals with the CFP applications, it’ll provide another opportunity to push back against Cedillo. Who wants as much taxpayer-financed parking for his/her customers as possible. Every business owner loves a good subsidy. Unless I’m mistaken, I think the business owner they’re referring to spoke against the parking and for the bike lanes. how is this legal?! as cedillo has reportedly said, 1000 people worked on the bike plan in 2010 and that included a meeting in HP about Figueroa, I was there and saw a ton of people weighing in. this was when Reyes was CM. boggles my mind that plans we all worked for then are now quickly dismantled by this newcomer? Cedillo is polling constituents to see what the majority want for changes to the streets. If other forms of transportation had to go through this gauntlet of majority preferences, then there would be very few sidewalk ramps for wheelchairs. After all, wheelchair users are also a 1% or less minority and council member Cedillo has made it quite clear he won’t be bullied by the safety improvement requests of the 1%. What needs to be done to get safety improvements for bicycling is a higher authority requiring this in much the same way as safety features must be installed by car manufacturers. There were no polls to see if voters wanted these safety features in cars. It just so happens that Congress put in their 2015 budget bill, or Cromnibus, a directive to create a separate non-motorized safety performance measure for pedestrians and bicycling. The irony is that Cedillo is the 1% dictating for the 99%. I live in the Lincoln Heights portion of CD1 and regularly commute by bike on Figueroa. No one from Cedillo’s office polled me. Unfortunately I have lost confidence in Councilman Cedillo. On video, he verbally supported several bike plan projects in NELA during his campaign. Many people, including myself, considered this when voting for him. Now I feel like I was duped. I cannot trust the word of my own representative. I am counting the days until his reelection. Is he up for reelection in 2015? I’m in CD14 so I can’t vote against him, but I will sure as heck volunteer in his opponent’s campaign and do whatever I can to ensure he’s a 1 term councilman. Nah, it was a woman working on opening a cafe next to Cedillo’s office. I got had to work on Tuesday and had a mechanical problem w my bike while the hearing was happening so I missed the live broadcast. The vote hardly surprised me, the city council votes unanimously on just about every topic. I personally am not totally against angled parking, especially if it is back-in angle parking and if it is implemented on BOTH sides of the street so that it reduces Fig to 1 lane in each direction (like Larchmont between 1st and Beverly). The problem I have is that Cedillo will use this as justification for killing the bike lanes throughout Fig which does not make sense. Also, I would appreciate some consistency in his rationale for opposing bike lanes. First he said he needed more outreach so he held meetings, robo-called, went door-to-door canvassing, phone banked, emailed, tweeted (he hardly tweets about public meetings), had staff stay after-hours to prepare for meetings. Then majority of attendees supported bike lanes he said it would cause issues for emergency responders. Then when pressed from LA Times he said not enough people were included in process (over 300 people attended his first couple meetings, unprecedented participation in a meeting about re-striping a street). But then he turns around and holds meetings were attendance barely reaches double digits and says that is sufficient to push for angled parking (which was never mentioned at any meetings, only by his own staff). And angled parking, which will physically prevent people from pulling over, is far more likely to cause issues for emergency responders than bike lanes (which would not physically narrow space to pull over). Someone needs to teach Cedillo, and his staff, including Louis Reyes and Sharon Lowe how to do simple math. Fig4All would cost less than half a million but improve safety for the entirety of Fig. Cedillo’s gold-plated plan will potentially slow traffic on as much as 5 blocks and cost millions of dollars. Which is the more cost-effective option? Your assessment of the irony and fact that 1) Cedillo’s approach is inconsistent with his stated position on bike lanes and 2) his concern over too few people dictating outcomes is spot on. He’s ignoring the data and facts in favor of his screwed up ideas that have even less input and support than the ones he is rejecting. Cedillo’s Folly: Council Adjourns in Memory of Veteran Killed Crossing North Fig. Editorial: Can LA Bridge Builders Reconfigure Our Riverside-Figueroa Bridge?